Civic knowledge and public engagement is at an all-time low. A 2016 survey by the Annenberg Public Policy Center found that only 26 percent of Americans can name all three branches of government, which was a significant decline from previous years.1 Not surprisingly, public trust in government is at only 18 percent2 and voter participation has reached its lowest point since 1996.3 Without an understanding of the structure of government; rights and responsibilities; and methods of public engagement, civic literacy and voter apathy will continue to plague American democracy. Educators and schools have a unique opportunity and responsibility to ensure that young people become engaged and knowledgeable citizens. While the 2016 election brought a renewed interest in engagement among youth,4 only 23 percent of eighth-graders performed at or above the proficient level on the National Assessment of Educational Progress (NAEP) civics exam, and achievement levels have virtually stagnated since 1998.5 In addition, the increased focus on math and reading in K-12 education—while critical to prepare all students for success—has pushed out civics and other important subjects. When civics education is taught effectively, it can equip students with the knowledge, skills, and disposition necessary to become informed and engaged citizens. Educators must also remember that civics is not synonymous with history. While increasing history courses and service requirements are potential steps to augment students’ background knowledge and skill sets, civics is a narrow and instrumental instruction that provides students with the agency to apply these skills. 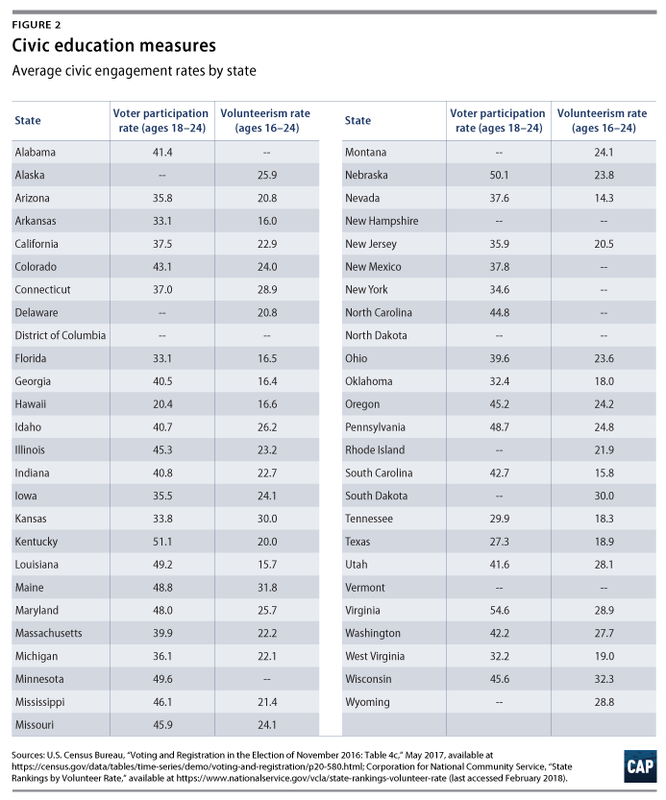 This analysis finds a wide variation in state requirements and levels of youth engagement. While this research highlights that no state currently provides sufficient and comprehensive civic education, there is reason to be optimistic that high-quality civics education can impact civic behavior. Here is the current state of civics education. While models for civic education vary widely, innovative programs designed by states, nonprofits, and schools have chosen new ways to promote civics education and increase youth community engagement. 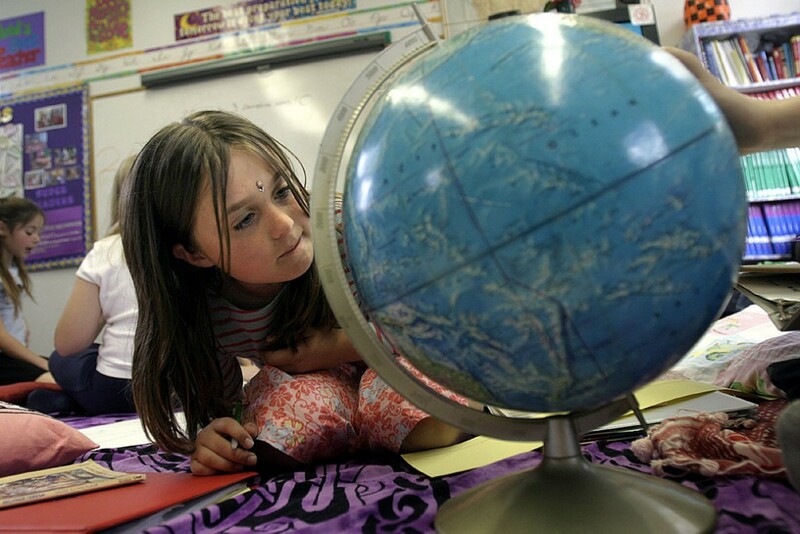 While most states require a half-year of civics education, Colorado and Idaho designed detailed curricula that are taught throughout yearlong courses. In fact, Colorado’s only statewide graduation requirement is the satisfactory completion of a civics and government course.18 Because all Colorado high schools must teach one year of civics, teachers are expected to cover the origins of democracy, the structure of American government, methods of public participation, a comparison to foreign governments, and the responsibilities of citizenship. The Colorado Department of Education also provides content, guiding questions, key skills, and vocabulary as guidance for teachers. Generation Citizen is a nonprofit that teaches what it terms as “action civics” to more than 30,000 middle school and high school students.24 The courses provide schools with detailed curricula and give students opportunities for real-world engagement as they work to solve community problems. Throughout a semester-long course, the nonprofit implements a civics curriculum based on students’ civic identities and issues they care about, such as gang violence, public transit, or youth employment.25 The course framework encourages students to think through an issue by researching its root cause, developing an action plan, getting involved in their community through engagement tactics, and presenting their efforts to their class. At the end of the 2016-17 school year, 90 percent of students self-reported that they believed they could make a difference in their community.26 With the goal of encouraging long-term civic engagement, Generation Citizen classes combine civics and service learning through a student-centered approach. Teaching Tolerance, an initiative through the Southern Poverty Law Center, provides free materials to emphasize social justice in existing school curricula. Through the organization’s website, magazine, and films, its framework and classroom resources reach 500,000 educators.27 Because Teaching Tolerance focuses on teaching tolerance “as a basic American value,”28 its materials are rich in civic contexts. The website, for example, provides teachers with student tasks for applying civics in real-world situations and with civics lesson plans on American rights and responsibilities; giving back to the community; and examining historical contexts of justice and inequality. Teaching Tolerance also funds school-level, classroom-level, and district-level projects that engage in youth development and encourage civics in action. YES (Youth Engaged in Service) Prep Public Schools is a public charter network in Houston that implements civics and service learning into its curriculum. Students in YES Prep’s schools complete service projects that are high-impact and grow students’ leadership skills, including summer enrichment programs with community service; mentorships between older and younger students; student-run service trips; and 50 hours of required community service.29 The high schools also require an ethics course in the senior year that neatly ties into students’ service projects. By teaching civics in tandem with experiential learning, YES Prep teachers, more often than traditional public or private school teachers, were “very confident” that their students learned “[t]o be tolerant of people and groups who are different from themselves,” “[t]o understand concepts such as federalism, separation of powers, and checks and balances,” and “[t]o develop habits of community service such as volunteering and raising money for causes,” according to 2010 American Enterprise Institute Program on American Citizenship survey.30 As a charter network serving low-income students, its service-centered mission serves both the students and their communities. The Cesar Chavez Public Charter Schools for Public Policy serve about 1,200 students through three campuses in Washington, D.C.31 Their proximity to the nation’s capital provides a unique opportunity to engage students in a public policy-centered curriculum. Their public policy program encourages students “to see themselves as change agents for their communities…”32 While all high school students must take an American government class, they also have multiple opportunities to turn their civic knowledge into agency.33 Each year, students must complete an advocacy project where they apply what they learn in class to current events, as they address policy issues facing the Council of the District of Columbia, U.S. Congress, and the federal courts. In ninth and 10th grades, Cesar Chavez students also complete a long-term community action project, where they use their personal interests to conduct research and address a public policy issue.34 Perhaps, most importantly, students complete a 2 1/2-week fellowship seminar in grade 11 that provides them with career, networking, and civic skills.35 With multiple opportunities for civic action, in addition to civic learning, students learn how to contribute to their communities; brainstorm solutions to local and global challenges; and engage with policymakers. A 2011 study of the Capitol Hill campus showed that the action-oriented curriculum was effectively preparing students to use their political skills to demand change.36 Schools that specialize in student engagement not only instill a strong emphasis on civic education, but also use tangible experience to prepare students to be the next generation of leaders. There are many policy levers for advancing civic education in schools, including civics or U.S. government courses; civics curricula closely aligned to state standards; community service requirements; instruction of AP U.S. government; and civics exams. While many states have implemented civics exams or civics courses as graduation requirements, these requirements often are not accompanied by resources to ensure that they are effectively implemented. Few states provide service-learning opportunities or engage students in relevant project-based learning. In addition, few students are sufficiently prepared to pass the AP U.S. government exam. Moreover, low rates of Millennial voter participation and volunteerism indicate that schools have the opportunity to better prepare students to fulfill the responsibilities and privileges of citizenship. While this brief calls for increasing opportunities for U.S. government, civics, or service-learning education, these requirements are only as good as how they are taught. Service learning must go beyond an act of service to teach students to systemically address issues in their communities; civics exams must address critical thinking, in addition to comprehension of materials; and civics and government courses should prepare every student with the tools to become engaged and effective citizens. Innovative efforts—such as Generation Citizen’s action civics programming and Judicially Speaking’s guest lectures from civics experts—have allowed for small changes to make a big impact on how teachers educate the next generation of leaders. While some highlighted examples have successfully reformed civics, more states, districts, and schools should invest in comprehensive and action-oriented civics curricula to build students’ capacity to become engaged and knowledgeable citizens. Sarah Shapiro is a research assistant for K-12 Education at the Center for American Progress. Catherine Brown is the vice president for Education Policy at the Center for American Progress. *Correction, May 10, 2018: This issue brief has been updated to provide the accurate number of states with a civics education requirement. **Correction, June 6, 2018: This issue brief provides the updated number of states—31—with a civics education requirement.